Seaflex, a Unique Maritime Group company which is one of the world’s leading integrated turnkey subsea and offshore solution providers supplied heavy duty WaterLoad Bags to Rigging Rentals for a project with Snowy Hydro Ltdat its Guthega Power Station, NSW. Snowy Hydro Limited is a business providing a complex array of financial hedge and insurance products to participants in the National Electricity Market (NEM). They are the leading provider of peak, renewable electricity to the National Electricity Market and a fully integrated Australian energy business with an excellent track record in financial performance, engineering innovation, workplace culture and business practices. Rigging Rentals specializes in lifting and rigging equipment hire across Australia. It services a range of industry sectors including mining, utilities, shipping, defense and engineering contractors. The Western Australian business of Rigging Rentals carries large-capacity lifting equipment for hire to the oil and gas industry. Ross Johnson (General Manager, Rigging Rentals) attended to the job site near Jindabyne NSW and commented “There was a requirement to apply a full load, thus a new control mechanism was installed and we had to supply equipment to test an overhead crane as it had undergone a major overhaul”. Guthega is one of nine (9) major power stations of the Snowy Mountains Scheme, a globally recognised integrated water and hydro-electric power scheme. In total, the power stations produce on average 4,500 gigawatt-hours of clean renewable electricity each year, to meet peak power demand. 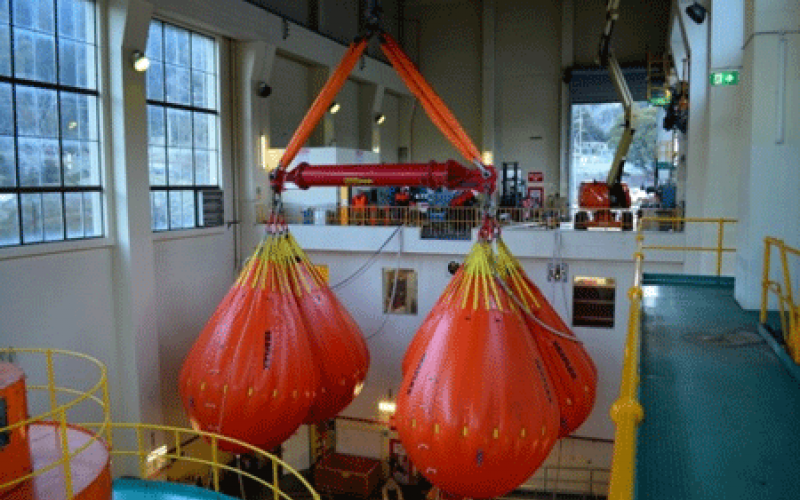 As part of a total packaged solution, Rigging Rentals supplied Seaflex heavy-duty water load bags which are used for testing applications for cranes. Rigging Rentals supplied 5 water load bags (132 tonnes capacity in total) on a dry-hire basis; a load cell (engineering instruments for load measurement); suitable hoses and fittings that match the fire safety standards onsite, a spreader beam; rigging gear, and large master links, amongst other things. “Our team worked with the engineering team at Snowy Hydro Ltd,” explained Ross Johnson. “We provided the relevant test certificates and tagged equipment as part of safety requirements contained in the Pre-Work Method Statement”. On this Occasion Graham Brading, Managing Director at Seaflex Ltd. commented “The Seaflex WaterLoad bags are fully compliant with the latest Lifting Equipment Engineers Association (LEEA) Guidance 051, to a design that has physically passed the 6:1 type test certification gained at the TUV National Engineering Laboratory in Glasgow. In addition, all Seaflex WaterLoad bags carry the ABS Product Design Assessment (PDA) certification. We are happy to be involved in this project and look forward to work with both our partners in the future”.